A scuba diver's dream came true. 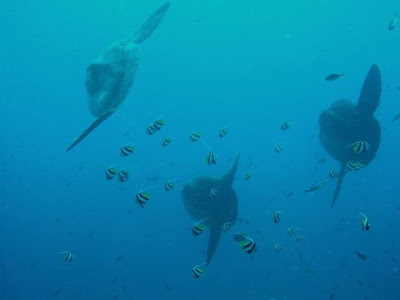 We spotted mola mola's (or sun fishes) yesterday off the coast of Nusa Penida, close to Bali. Photo from Nusa Penida, Crystal Bay dive site. Courtesy of this picture goes to C, my underwater camera is in repair since one week. BTW, sightings of these mind-boggling creatures are fairly predictable from end of July to beginning of October in Bali (Nusa Pendida).